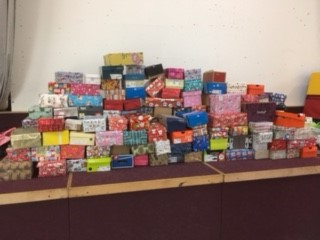 The school has been overwhelmed by the response of parents, pupils and staff to our recent shoebox appeal in aide of Gambia. This was an initiative led by our School Council who have decided that they want to increase their efforts in fundraising and supporting Project Gambia this school year. The shoeboxes will now be loaded into a shipping container before making the journey south by sea to West Africa, where children and families in the Banjul area will benefit from our collective generosity.